In 1846, what would have roared in today as a Category 5 hurricane (think Katrina) pummeled Key West, Florida, leaving only eight of the island's 600 houses standing. The unassuming yellow clapboard cottage with a long, sloping metal roof, black louvered shutters, and a white picket fence is one of those resilient rarities that survived the storm. Now the vacation home of Tennesseans Melinda Story and her husband, Jim, the house was built in 1841, only 20 years after the Spanish land-grant island was sold off--twice--to unsuspecting Americans in one of southern Florida's earliest land scams. (Land-grant holder Juan Pablo Salas first traded the island for a sloop valued at $575 before turning around and selling the same land to another individual for $2,000.) Early in its history, the house was moved to its present location in the heart of what is now the island's historic district. Conveyance was smart and relatively labor-friendly: The house was rolled across logs to its new site. "Its construction of Dade County pine, which is now extinct, is why this house survived the move and all those horrific hurricanes," theorizes interior designer Todd Richesin, who, like the homeowners, is from Knoxville. He collaborated on the meticulous restoration with Key West architect Tom Pope. "The pine is notched, and it bends with the winds," explains Richesin. "Dade County pine is considered a hardwood, and if you've ever driven a nail into it, you understand why. We broke countless nails just trying to hang pictures." Fully exposed, those dense pine walls and ceilings are the centerpiece of Pope's restoration, which received the Historic Florida Keys Foundation's 2009 excellence award for a residential restoration. 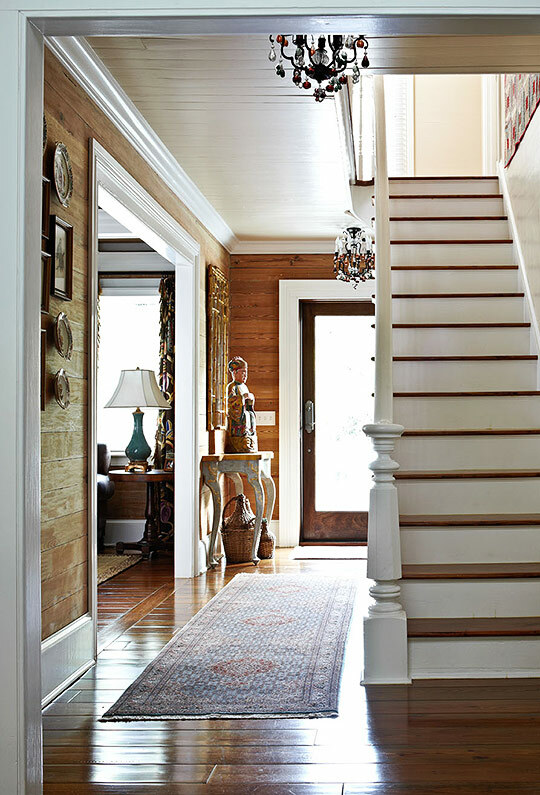 Starting at the entry, the horizontal thrust of the wide honey-hued planks transports the eye from room to room in an envelope of warmth, antiquity, and craftsmanship. "The restoration was so exacting that when we rebuilt the windows, we not only recycled all of the original rolled glass, we made repairs using old wood," Pope explains. Antiques were a natural against these original backdrops. "Our goal was to honor the age of the house with a collection of European and American antiques," says Richesin. 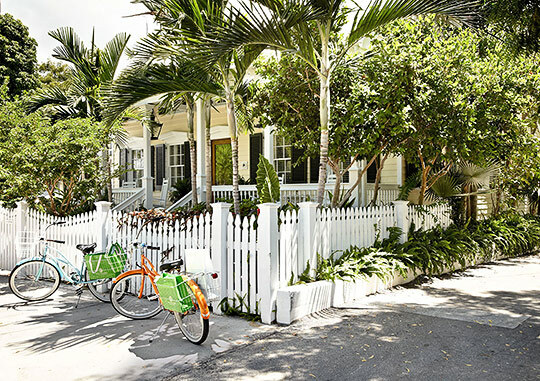 "But at the same time, we wanted to make the house feel like Key West, which meant keeping it very fresh and light." Modern fabrics and upbeat colors were the answer. "I love color," notes Melinda, "and Todd chose a palette of my favorites." It wasn't hard. This is the third home Richesin has designed for the couple. 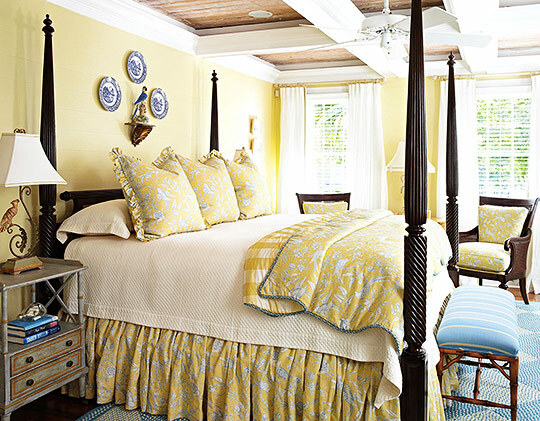 "Dusty blue, pale rose, and butter yellow are the colors Melinda likes to live with," he says. "I know her taste." Even in picture frames. "One day when we were out shopping, I narrowed down the choices in picture frames for Melinda. I gave her options but knew exactly which molding she'd pick," recounts the designer. "She always goes for what's prettiest. As she confessed to the shop owner, she's 'addicted to pretty.'" Richesin also knew that feminine toiles and florals in soft colorways were the right direction for fabrics. "But I always like to give my clients choices so that it becomes their home, not mine," says the designer. Melinda's favorite pick for this house--a blue-and-rose floral pattern in a luxurious lampas weave--was the foundation. "We really started the whole design with this fabric," says Richesin. "The weave is fancy, but the coloration makes it playful and fun." 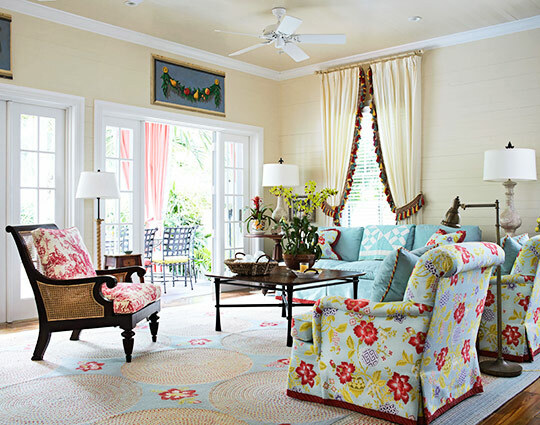 Not only did he cover a pair of custom club chairs for the great room in the cheery pattern, he extracted portions of the fabric's motifs to include on a wool braided-and-hooked rug he designed for the space. With only a bit of the fabric's pattern repeated, the rug stitches the room together without making it appear too matched. "What I like about these rugs is that they're an old-fashioned product, recolored and made fresh," adds Richesin. "Yet still, it's a classic look." Classic enough for heads of state--the small North Carolina mill's stunning rugs decorate the public spaces in the White House. A pale blue Ultrasuede custom sofa and toile-covered teak- and-cane chairs complete the great room's seating. "Comfort was of the utmost important," stresses Richesin. "Jim and I are both readers," injects Melinda. "It was important to us that every chair be comfortable enough to curl up in with a book." Practicality figured in, as well. "This house is our escape," says Melinda. "We ride our bikes everywhere, we sit by the pool, we relax. We didn't want anything so precious that we wouldn't feel comfortable sitting on it in our still-damp swimsuits." And when their grown children visit or Melinda entertains a small group of friends over wine, low-maintenance functionality is even more important. "Every fabric is durable but high quality," observes the designer. "The lampas weave on the club chairs has a very luxurious hand," he notes, "and the wool rugs in all the rooms are extremely soft on bare feet." Other fine touches appear quietly in the details--the elegant trim that finishes the great room's simple pull-back drapery panels and the delicate blown-glass fruit in the foyer's pair of jewel-tone chandeliers. Amazingly, the restoration occurred within the house's existing footprint. "It was a once-in-a-lifetime opportunity because the house was relatively untouched and in its original configuration," says Pope. "There were three downstairs rooms originally. The front room, now used as an office, was a parlor that you entered from the front hall, just as now. The other two rooms were a kitchen and bathroom behind the parlor. We combined those rooms into a great room by removing the walls and adding a structural beam above the ceiling line so the ceiling is continuous," explains the architect. The downstairs master suite, adjacent to the great room, is part of an earlier addition. Pope opened up the back with French doors, created a covered porch, and built a pool. A small outbuilding that had served as a kiln for a previous owner was transformed into a charming guesthouse. Richesin picked up where the architect left off, extending the palette outdoors with draperies and all-weather upholstered furniture. Antiques like the great room's Louis XV step-back cupboard--the first piece collected for the home--underscore the house's historic quality. "We wanted a mix of antiques," says Richesin. "Melinda's a passionate collector of nice antiques of all periods and styles." In addition to 18th- and 19th-century French and English antiques, a 1790 Kentucky pine cupboard furnishes the great room. "We needed large pieces for storage because there is not much cabinetry in the small galley kitchen behind the living area," Richesin observes. Much of the home's personal feel, however, emanates from its smaller pieces--art and accessories. Tropical-bird prints dress the entry; rooster paintings and figurines honor Key West's legendary free-roaming chickens. Displayed as art, old plates serve up a healthy dose of pretty, and even new pottery features Melinda's favorite azure glaze. "You'll notice that not every wall is covered in art," says Richesin. "That's because the collection is still evolving. Every piece must have meaning." More than any other space, the master bedroom says retreat. "It's light and ethereal, like being in a cloud," says Richesin of the sky-blue room with a cloud painting behind the bed. But despite the vacation home's sense of airy escape, it remains rooted in terra firma--grounded, charmingly, in history. Architect: Thomas Pope, Thomas E. Pope Architect, 7009 Shrimp Rd., Key West, FL 33040; 305/296-3611, thomasepope.com. Interior designer: Todd Richesin, Todd Richesin Interiors, 10005 Casa Real Cove, Knoxville, TN 37922; 865/675-5828, toddrichesininteriors.com. A luxurious Scalamandré floral weave on custom club chairs sets the home's palette. 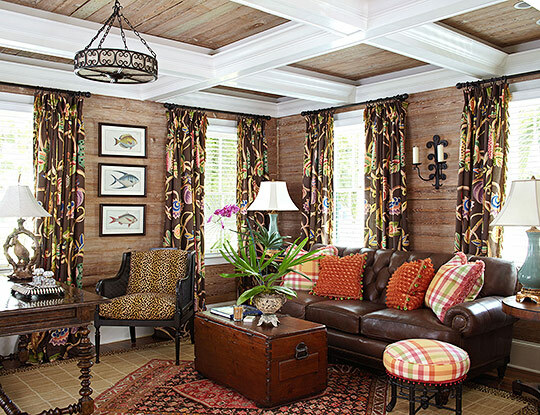 Sofa fabric is Osborne & Little; drapery fabric is Robert Allen, with custom fringe. Just behind the chairs (not pictured) is the kitchen island. A Visual Comfort floor lamp between club chairs supplements table lamps created from 19th-century Italian balustrades. Braid-and-hooked area rug (custom): Todd Richesin Interiors, 865/675-5828, toddrichesininteriors.com. Sofa ("Weston" #0533-85); lounge chairs ("Colefax" #0509-21): Hickory Chair, 800/349-4579, hickorychair.com. Fabric on sofa and lounge-chair pillows ("Mezzola"/Sea #D1090/28, by Designers Guild): Osborne & Little, 877/322-7420, osborneandlittle.com. Quilt: Bobby Todd Antiques, 423/337-3837, bobbytoddantiques.com. Fabric on lounge chairs and sofa pillow ("Bali"/Lampas #26734-002): Scalamandré, 800/932-4361, scalamandre.com. Trim on pillows: Todd Richesin Interiors, 865/675-5828, toddrichesininteriors.com. Occasional chair ("Lord Clive Lounge Chair" #362, The British Khaki Collection): Robert Lighton New York, 212/343-2299, britishkhaki.com. Chair fabric ("Toile Villageoise"/Rouge Fond #B1731-1):Pierre Frey, 866/707-1524, pierrefrey.com. Round table (antique); coffee table (antique): Bobby Todd Antiques, 423/337-3837, bobbytoddantiques.com. Drapery ("Paolo"/Oyster): Robert Allen, 800/333-3777, robertallendesign.com. Drapery fringe (custom): Todd Richesin Interiors, 865/675-5828, toddrichesininteriors.com. Table lamps (antique, Italian balusters); small table (antique): owner's collection. Floor lamp by table ("Twist Balustrade Floor Lamp"/Fence Post Wash on Bronze, museum-mount base, with natural paper shade #SL1142FPW-NP); floor lamp by lounge chairs ("Adjustable Reeded Floor lamp"/Antique Burnished Brass #CHA9127ABV): Visual Comfort & Co., 713/686-5999, visualcomfort.com. Paint ("Pale Almond" #OC-2, satin impervo finish): Benjamin Moore & Co., 888/236-6667, benjaminmoore.com. 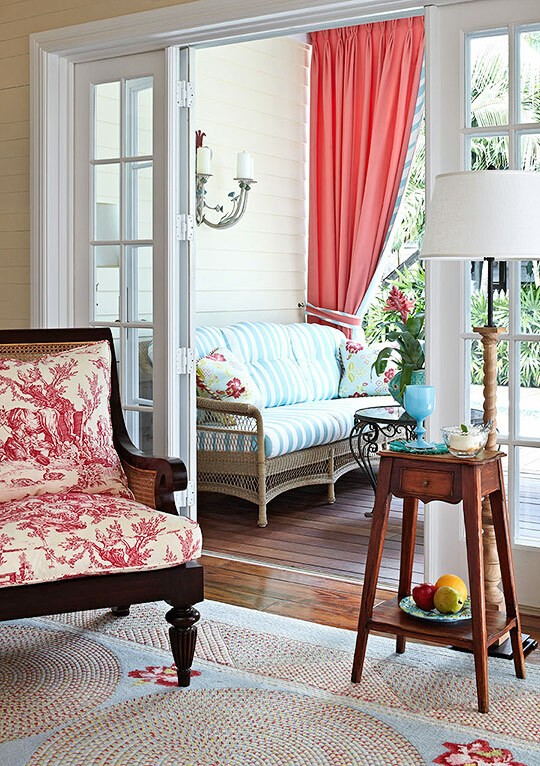 The great room's petite 18th-century French table and the Pierre Frey toile-covered British Khaki Collection lounge chair segue to the porch's Brown Jordan rattan sofa covered in a Lee Jofa stripe. Rattan sofa ("Eastlake"/Rattan #2370-6300): Brown Jordan, 800/743-4252, brownjordan.com. Striped fabric on sofa and drapery ("Marina Stripe"/Aqua #2005235-13, discontinued): Lee Jofa, 800/453-3563, leejofa.com. Coral drapery ("Guadeloupe" solid/Coral #36235-015): Scalamandré, 800/932-4361, scalamandre.com. Round table (antique, iron); wall sconce (vintage): Bobby Todd Antiques, 423/337-3837, bobbytoddantiques.com. Exterior wall paint ("Hepplewhite Ivory" #HC-36); exterior ceiling paint ("Teardrop" #2060-70, custom); shutter paint ("Black Forest Green"); trim paint ("Brilliant White"): Benjamin Moore & Co., 888/236-6667, benjaminmoore.com. Pine walls and ceiling are original. Console table (custom): Amy Howard Collection, 901/547-1448, amyhowardcollection.com. Carved figure (from Bali): owner's collection. Italian faux bamboo mirror (vintage): Bobby Todd Antiques, 423/337-3837, bobbytoddantiques.com. Tabriz rug: Persian Galleries, 865/558-8777. Chandeliers ("Ceiling Mount Crystal Chandelier with Fruit"/Dark Stained Bronze #1447/F/FRT): New Metal Crafts, 312/787-6991, newmetalcrafts.com. Paneling (Dade County Pine): original to house. Flooring (antique heart pine): through Todd Richesin Interiors, 865/675-5828, toddrichesininteriors.com. Vintage Copeland Spode plates and ornithological prints on the original 1841 pine walls team up with a New Metal Crafts chandelier in the entry. 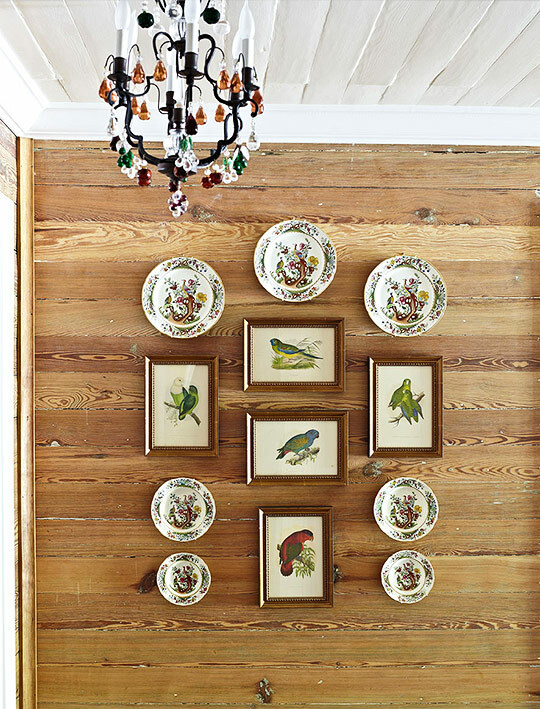 Plates and bird art: owner's collection. Chandelier ("Ceiling Mount Crystal Chandelier with Fruit"/Dark Stained Bronze #1447/F/FRT): New Metal Crafts, 312/787-6991, newmetalcrafts.com. Ceiling paint ("Pale Almond" #OC-2): Benjamin Moore & Co., 888/236-6667, benjaminmoore.com. Originally the parlor, the front room now is Jim's office. An antique English trunk services a leather Hancock & Moore sofa. Clarence House fabric at the windows mixes with Cowtan & Tout's animal print on the Minton-Spidell cane chair. Desk ("Dutch Writing Table" #F-DE01): Formations, 310/659-3062. Sofa ("Robinson Tufted Sofa"/Lineage finish #4236); leather sofa fabric ("Lambskin Walnut"): Hancock & Moore, 828/495-8235, hancockandmoore.com. Orange pillows on sofa ("Blink"/Orange #8354.270): Zimmer + Rohde, 866/627-6899, zimmer-rohde.com. Orange-pillow trim ("Pom Pom Fringe" #T30394-324): Kravet, 888/457-2838, kravet.com. Plaid fabric on pillows and stool ("Elysia Plaid"/Yellow, Pink #2005106-407): Lee Jofa, 800/453-3563, leejofa.com. Plaid pillow loop fringe (#T30395-724); trim on stool ("Ball Fringe" #T30390-24): Kravet, 888/457-2838, kravet.com. Stool (antique): Bobby Todd Antiques, 423/337-3837, bobbytoddantiques.com. Trunk (antique); round table (antique) shelf table (antique): owner's collection. Celadon lamps ("Resolution Table Lamp"/Celadon Crackle #6633): Currey & Co., 877/768-6428, curreyco.com. Lamp on desk ("Parrot Lamp" #L91): Patina Inc., patinainc.com. Cane chair ("Brighton Chair"/London Black finish #6146.11): Minton-Spidell, 310/836-0403, minton-spidell.com. Chair fabric ("Ocelot"/Brown, Black #10877-02): Cowtan & Tout, 212/647-6900, cowtan.com. Drapery ("Jembala Print"/Brown #34054-4); drapery fringe ("Eugenie Candle Fringe," custom color): Clarence House, 800/803-2850, clarencehouse.com. Area rug (custom): Todd Richesin Interiors, 865/675-5828, toddrichesininteriors.com. Chandelier (custom): Ironware International, 800/850-0460, ironwareinternational.com. Candle sconce above sofa: Bobby Todd Antiques, 423/337-3837, bobbytoddantiques.com. 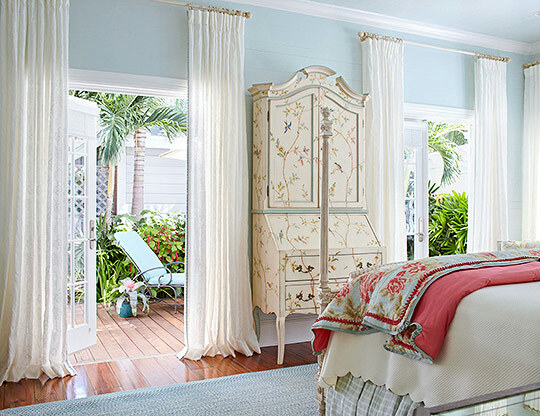 At the back of the house, off the great room, the master bedroom includes Amy Howard mirrored bedside chests, Clarence House drapery fabric, a Brunschwig & Fils bed-skirt fabric, and a painting by Susan Sugar. Bed (custom, by Lewis Mittman): Edward Ferrell-Lewis Mittman, 212/888-5580, ef-lm.com. Bed skirt ("Spring Time Linen Sheer"/Robin's Egg #53572.01, discontinued): Brunschwig & Fils, 800/538-1880, brunschwig.com. Floral pillows and scaldino ("La Fenice"/Robin's Egg #34175-3): Clarence House, 800/803-2850, clarencehouse.com. Bed cover (discontinued): Anichini, 800/553-5309, anichini.com. For similar: Todd Richesin Interiors, 865/675-5828, toddrichesininteriors.com. Mirrored bedside chests ("Stanley Mirrored Nightstand"/Silver Gilt, with antique mirror #1109): Amy Howard Collection, 901/547-1448, amyhowardcollection.com. Glass lamps: Visual Comfort & Co., 713/686-5999, visualcomfort.com. Art over bed (by Susan Sugar): Susan Sugar, 646/458-1438, susansugar.net. Bench ("Simon" #5409-29, in custom cream lacquer finish by Todd Richesin): Hickory Chair, 800/349-4579, hickorychair.com. Bench and desk-chair fabric ("Ocelot"/Aqua, Sand #10877-06): Cowtan & Tout, 212/647-6900, cowtan.com. Braided area rug (custom): Todd Richesin Interiors, 865/675-5828, toddrichesininteriors.com. Writing desk ("Trieste Console" #F-CN15, in 30-inch custom height): Formations, 310/659-3062. Lamp on writing table (vintage); iron chair at writing table (vintage): Bobby Todd Antiques, 423/337-3837, bobbytoddantiques.com. Embroidered sheers ("Florence"/Ivory #F3223-01): Cowtan & Tout, 212/647-6900, cowtan.com. Glass bead trim on sheers (#T30391-35): Kravet, 888/457-2838, kravet.com. Blinds: Hunter Douglas, 800/274-2985, hunterdouglas.com. Wall paint ("Green Cast" #842, satin impervo finish); trim paint ("Super White," satin impervo finish): Benjamin Moore & Co., 888/236-6667, benjaminmoore.com. Part of an earlier addition, the master bedroom opens onto a private side of the house. The secretary is from Patina Inc.
Secretary ("Palazzo Secretary," Venetian Teahouse Collection): Patina Inc., patinainc.com. 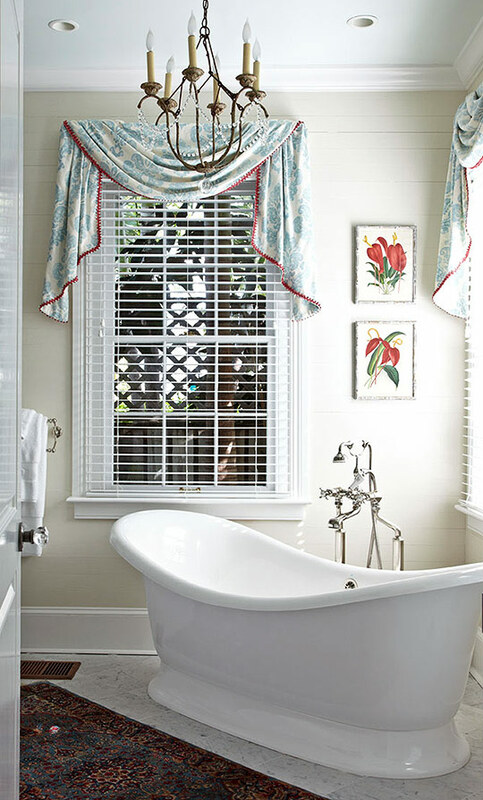 A Niermann Weeks chandelier, Cowtan & Tout fabric on the valances, and Hunter Douglas blinds decorate the master bath. In addition to a shower stall, the room includes a deep soaking tub from Victoria & Albert LLC. Tub ("Marlborough"): Victoria & Albert LLC, 800/421-7189, vandabaths.com. Faucets (Perrin & Rowe): Rohl, 800/777-9762, rohlhome.com. Chandelier ("Italian Chandelier"/Chalk Rust #10-01590): Niermann Weeks, 212/319-7979, niermannweeks.com. Valances ("Sutton"/Aqua #J376F-04, by Jane Churchill): Cowtan & Tout, 212/647-6900, cowtan.com. Trim ("Ribbon Braid" #214-203-392): Décor de Paris, 800/221-6453, decordeparis.com. Area rug (antique Kirman): Persian Galleries, 865/558-8777. Wall paint ("White Down" #OC#131); ceiling paint ("Green Cast" #842); trim paint ("Super White"): Benjamin Moore & Co., 888/236-6667, benjaminmoore.com. Sunny Scalamandré linen toile dresses Hickory Chair's cane chairs and the pillows, duvet, and bed skirt in a guest room. Bed ("Lord Mountbatten Tester Bed"/Dark teak #451, The British Khaki Collection): Robert Lighton New York, 212/343-2299, britishkhaki.com. Bed pillow, scaldino and bed-skirt fabric ("Aviary"/Yellow #16352-001): Scalamandré, 800/932-4361, scalamandre.com. Plaid scaldino lining ("Bahar"/Daffodil): Robert Allen, 800/333-3777, robertallendesign.com. Braided rug (custom): Todd Richesin Interiors, 865/675-5828, toddrichesininteriors.com. Bedside tables ("Regency Etagère" #259, with custom finish "Toscana Tiffany Blue" with "Mollie Yellow" decoration): Amy Howard Collection, 901/547-1448, amyhowardcollection.com. Bedside lamps ("Parrot Table Lamp" #6791): Currey & Co., 877/768-6428, curreyco.com. Bed cover: Anichini, 800/553-5309, anichini.com. Bench ("Bamboo-Style Bench"#BCH1204/6/Faux Bamboo finish): Louis J. Solomon, 212/545-9200, louisjsolomon.com. Cane chairs ("Cane-back Chair"/American Antique finish #5917-10): Hickory Chair, 800/349-4579, hickorychair.com. Chair fabric ("Aviary"/Yellow #16352-001): Scalamandré, 800/932-4361, scalamandre.com. Drapery ("Barnveld"/Oyster): Robert Allen, 800/333-3777, robertallendesign.com. Braid trim ("LouisXV Braid"/Wedgwood, Cream, Gold #V741-003): Scalamandré, 800/932-4361, scalamandre.com. Wall paint ("Hawthorne Yellow #HC-4); trim paint ("Super White"): Benjamin Moore & Co., 888/236-6667, benjaminmoore.com. An old studio is now a guesthouse. Round table (antique, iron): Bobby Todd Antiques, 423/337-3837, bobbytoddantiques.com. Dining chairs ("Florentine"/Iron Age #2240-2000, finish discontinued): Brown Jordan, 800/743-4252, brownjordan.com. Aqua seat-cushion fabric ("Guadeloupe" solid/Aqua #36235-017); coral seat-cushion fabric ("Guadeloupe" solid/Coral #36235-015): Scalamandré, 800/932-4361, scalamandre.com. Decking: Ipe Decking, 877/896-3884, ipedecking.com. Homeowner Melinda Story and designer Todd Richesin sun by the pool in front of coral Scalamandré draperies.